In The Water of Life (Uisge beatha), a work of historical fiction, Canadian author Daniel Marchildon demonstrates a deep understanding of the turbulent history of Scotch whisky. Part celebration of Scottish pride and the legacy of English conquest, epitomised in the battle at Culloden and the devastating clearances that ensued, and part a depiction of the oft times ill-fated story of the Highland single-malt distilleries, The Water of Life sits alongside Mal Peet’s acclaimed novel Tamar as a thoroughly entertaining read. The reader is reminded of the scourge that is empire, and the wound carried in the hearts of those hailing from devastated lands, a wound passed down through the generations along with a treasured spiritual or cultural essence. In Scotland’s case this essence, held dear by so many, is spiritual in a literal sense, embodied in the spirit of whisky. The story, spanning six centuries and following three interconnected bloodlines and two continents, Canada and Scotland, is triggered when descendent Elizabeth Legrand takes her first taste of the legendary Gleann Dubh and decides in a moment of reckless spontaneity to open her own distillery, making use of the pristine waters and sublime scenery of Canada’s Georgian Bay. Elizabeth’s story with its highs and its tragedies frames an epic narrative, one that serves to explain how it is that the whisky she imbibes has found its way into the cellar of her house. Embedded in the secondary narrative is a fascinating and well-researched history of Scotch single-malt whisky, from its early genesis in the monasteries that supplied the Crown, through hardship and numerous catastrophes—not least the production of cheaper blended whiskies—to its present day status as one of the most revered spirits in the world. Thankfully absent from Marchildon’s engaging rendering is a tendency of historical fiction to slip into pastiche. The story of Scotch, as depicted in The Water of Life, is one of lineage, the methods of distilling passed from father to son. Whisky might be the Highlanders’ weapon against empire, yet it proves all too often to backfire. Each generation faces its own tribulations, all of them the result of their reverence for whisky. The author sets alive these struggles, drawing the reader close to the drama through his mastery in conveying the emotions of his characters. After a long moment, Robb saw his silhouette reflected in the water of the stream by moonlight. He splashed his face. The cold of the water and of the night pierced the veil of his drunkenness. He was still shaking, but from weakness and cold. Anger gradually gave way to clear-headedness, and he considered his situation with a calm, analytical eye. He wiped his mouth with the back of his sleeve. He couldn’t dispel the bitter taste, or the resentment that would, from now on, become part of the whisky he’d create. Throughout the story, present and past are seamlessly interwoven in short alternating chapters, the reader led gently along, aided by the bloodlines’ family tree presented in the front pages. For a reader not adept at remembering names, this family tree proves a boon, as The Water of Life is rich with characters, each depicted with sympathy and flair. Even incidental characters are vividly portrayed. Although the real protagonist of the story is whisky itself, narrated through the lens of the primary characters, all of who share a devotion to the spirit that borders on religious zeal. The Water of Life is a story of passion, the author clearly enamoured with his subject, yet this can hardly be described a flaw. Written with an unassuming literary style, Marchildon’s prose is elegant and well crafted, his sensual appreciation shining through the story whenever one of the characters savours a taste of Gleann Dubh. Fiery tongues lick the inside of his mouth, kiss him and make him tremble. Countless examples of such luscious sentences are peppered through the narrative, commensurate with the experience of tasting truly fine single malt. It’s enough to make even the most hardened teetotaller wish she had a bottle and a glass by her side. This whisky comes to her from another century, from a marriage, from a legendary crossbreeding, in fact. The fireworks exploding in her mouth spread all through her limbs, reaching her heart and her brain at the same time. This euphoria, both so sensual and so cerebral, makes her moan. The need for foreshadowing in a story as complex as The Water of Life is transparent, the reader carried along through the unfolding dramas by a sense of anticipation. For some, this foreshadowing is perhaps a little overplayed. Yet this is a matter of style, and many readers would benefit from the dramatic accents that close each scene. In all, The Water of Life is a superb novel. Upon reading the last sentence the reader is left feeling not only entertained and fulfilled, but with a vast knowledge of the history of something they may previously have known little or nothing about: Scotch whisky. 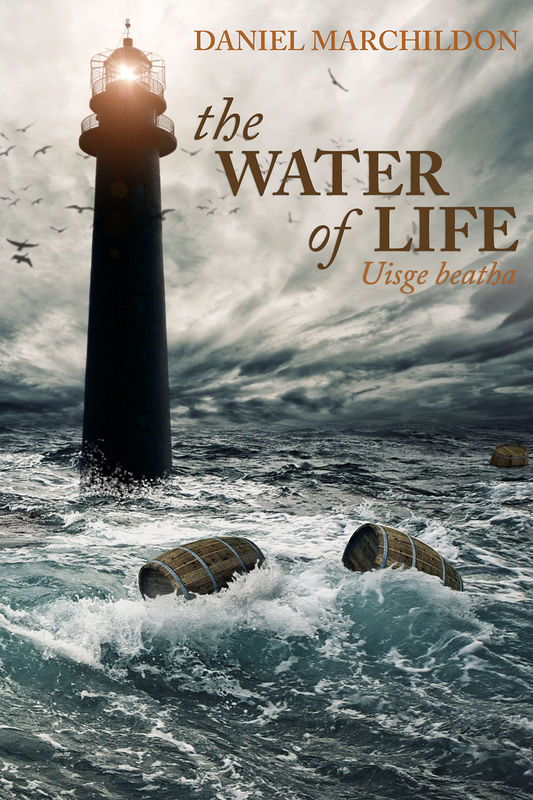 The Water of Life lingers in the memory, a book to be savoured, like a dram of Gleann Dubh. Marchildon’s novel warrants the literary merit awarded the original French edition by the Conseil supérieur de la langue française du Québec, when The Water of Life won the Émile-Ollivier literary prize in 2009. The work has been superbly translated by Märta Ziemelis. The Water of Life (Uisge Beatha) by Daniel Marchildon was published by Odyssey Books in July 2015 and is available in paperback and ebook editions. 322pp $24.95. You can also find my review at the author’s website.